Spatially, a provider of location intelligence software, chose CrateDB over Postgres and Cassandra to give SMBs a comprehensive view of customers and business opportunities in their area. Spatially uses CrateDB for rapid analysis of tens of terabytes of Localgraphics™ data compiled about major U.S. cities like Boston, Seattle, and Miami. Postgres couldn’t keep up with the data we have; Datastax Enterprise had ingest scaling issues with spatial data; Cassandra didn’t have spatial query operations. CrateDB was the only database we found that could smoothly process data for our users and for our data science team. We fell in love with it immediately. 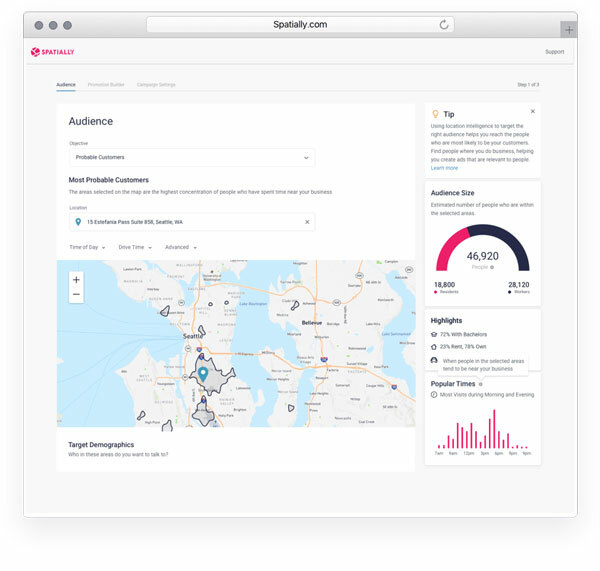 Spatially uses massive datasets, such as U.S. census data, public transit, traffic and device-tracking data, to help SMBs decide where to put their business and how to advertise to their customers. Its customers can look at foot and vehicle traffic, spending and both facility and advertising placement by local competitors. "Spatially is a data-driven platform, so finding the right database was critical," said Spatially CTO, Kartik Venkatesh. "Postgres couldn’t keep up with the data we have; Datastax Enterprise had ingest scaling issues with spatial data; Cassandra didn’t have spatial query operations. CrateDB was the only database we found that could smoothly process data for our users and for our data science team. We fell in love with it immediately." To find geographic insights through the patterns and relationships in their data, Spatially data scientists analyze terabytes of data in CrateDB using SQL, GO, Python, R, Spark/EMR and others. Spatially engineers then implement those data sets, queries and algorithms in a customer-facing SaaS system that is also powered by CrateDB. Spatially plans to scale CrateDB to handle hundreds of terabytes as it continues to expand to other cities. "The places customers go in their cars and with their phones can fundamentally change an SMB’s advertising strategy, or even the location of their business. We built CrateDB to support this type of data and we’re thrilled to see it shaping the world we live in."